Sherry Piersol needed space all her own, where she could transform into her pen name, S.G. Savage. Sherry writes a fictional series, Lydia’s League of Angels, a five book series, which brings awareness to the issues of child abuse and human trafficking. After her first book made it to print and the second one was in the works, she realized it was time to find that space. "I wanted something very custom," Sherry said. 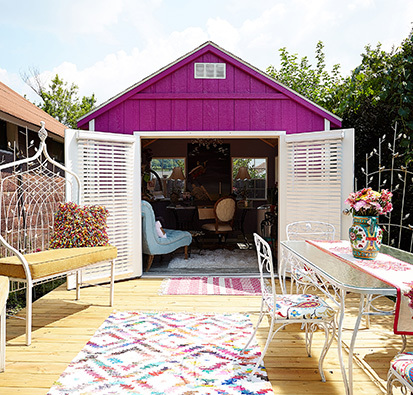 Sherry's shed is 10'x10' Hanover with SmartSide in Viva Violet and Soft White accents, Weathered Wood shingles, Radiant Barrier roof sheathing, 72" fiberglass double entry doors and four 30"x36" aluminum windows. 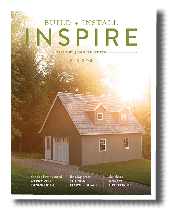 “I was at a home and garden show a couple of years ago, when the ‘She Sheds’ were becoming a big thing, and that’s where I saw the barn and thought, ‘Wow, that would be a great space for me if we can heat and put air conditioning in it. I could have a place to work that was just in the backyard,’” Sherry recalled. Sherry worked one-on-one with a JDM staff member to completely customize her Hanover shed. The design centers around an original painting that she describes as an impulse buy. The unique painting features a woman jumping off a trolley with an elaborate cathedral in the background. 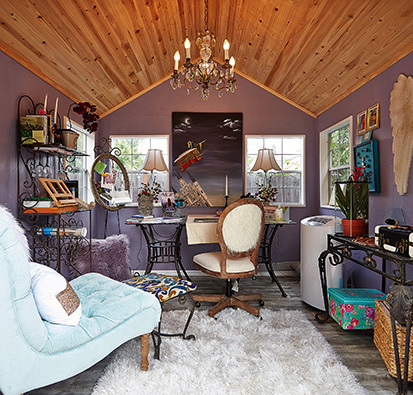 When visitors enter the shed through french doors, they see the painting hanging above a large table she converted into her desk, complete with a fuzzy backed chair, a 70s-style turntable, golden angel wings, various inspirational items, and a vintage chandelier from an old Catholic church. The shed also has four windows to allow for as much natural light as possible. 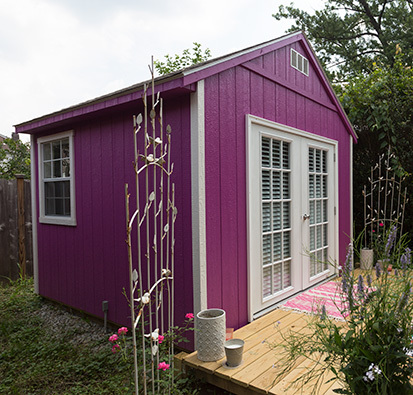 To complete her shed, Sherry chose Viva Violet, a color normally used for KidzSpace models, as her exterior color. Her shed is unique and a direct reflection of her personality: fun, bright, and colorful. In her “writing abode,” Sherry completed the second book in the series, and has the third book in the works. She uses her shed as an escape, never taking her phone and only putting items in the shed that inspire her. It’s a place she created for herself and no one else, which makes it special.